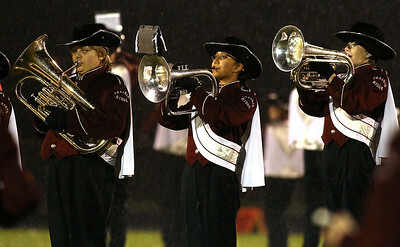 H. Rick Bamman - hbamman@shawmedia.com Memebers of the Prairie Ridge marching band perform during the pre-game program on Friday, Oct 23, 2015. H. Rick Bamman - hbamman@shawmedia.com Prairie Ridge tight end Dean Brown lines up for the play in the firsy half on Friday, Oct 23, 2015. 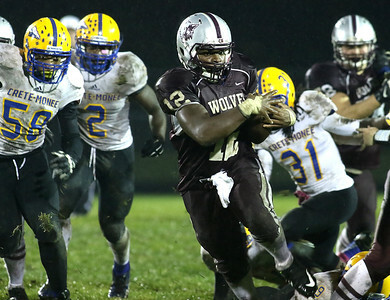 H. Rick Bamman - hbamman@shawmedia.com Prairie Ridge's running back Emmanuel Ebirim runs through a gapping hole in the Crete-Monee defensive line in the first half on Friday, Oct 23, 2015. 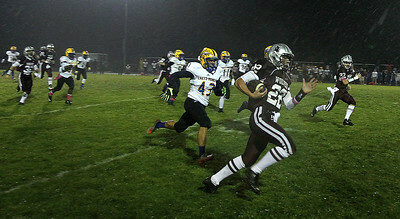 H. Rick Bamman - hbamman@shawmedia.com Crete-Monee defenders chase Prairie Ridge's Samson Evans has he takes the opening kick off 75 yeards on Friday, Oct 23, 2015. 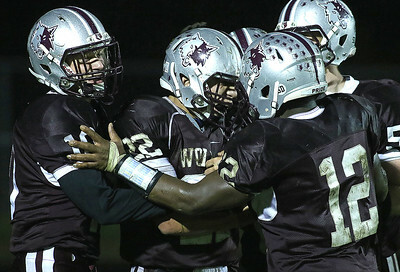 H. Rick Bamman - hbamman@shawmedia.com Prairie Ridge's Samson Evans (22) celebrates with teammates Dean Brown (10), Emmanuel Ebirim (12) after a first half touchdown on Friday, Oct 23, 2015. 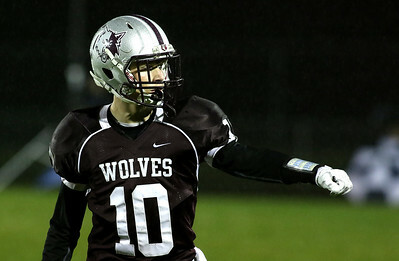 H. Rick Bamman - hbamman@shawmedia.com Prairie Ridge's Samson Evans takes the snap in the first half against Crete-Monee on Friday, Oct 23, 2015. 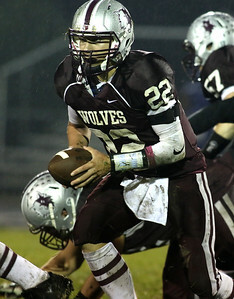 Evans led the Wolves to a 52-33 victory. H. Rick Bamman - hbamman@shawmedia.com Prairie Ridge's Samson Evans tears up the field for a first down against Crete-Monee on the first half on Friday, Oct 23, 2015. 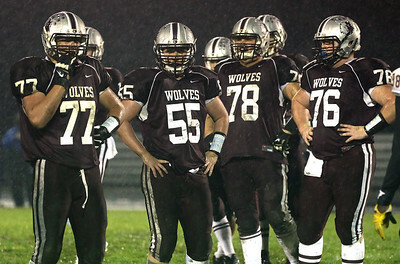 H. Rick Bamman - hbamman@shawmedia.com Prairie Ridge offensive linemen from left Jeffery Jenkins, Ryan Orr, Luke Ponga and Dereck Pearson come to the line in the first half against Crete-Monee on Friday, Oct 23, 2015. 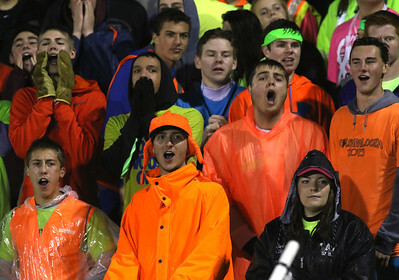 H. Rick Bamman - hbamman@shawmedia.com Prairie Ridge super fans react to a play in the first half on Friday, Oct 23, 2015. 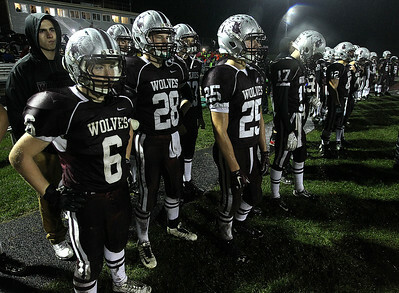 H. Rick Bamman - hbamman@shawmedia.com Prairie Ridge players watch the action on the field from the sideline on Friday, Oct 23, 2015. 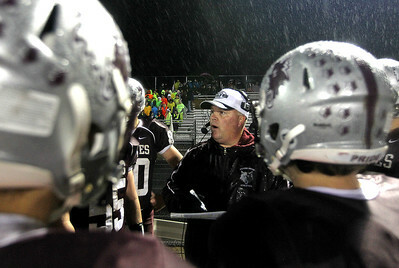 H. Rick Bamman - hbamman@shawmedia.com Prairie Ridge head coach Chris Schremp huddles with his team on the sidelines in the first half on Friday, Oct 23, 2015.